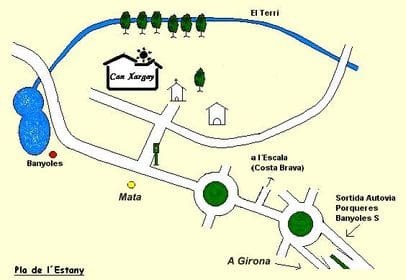 There are two airports: Girona airport 20 km. far and Barcelona airport 115 km. far. To come here, you can take the AP-7 (E-15) motorway sixth leaving going on direction to Banyoles. There are 9 km. of main road (C-66). After, you should take the road which goes on direction to Mata - Banyoles Sud (C-150a) and at the second traffic lights crossing, you should turn right. Nearly 100 metres you will find Can Xargay house. It's located at the left hand of the Mata´s church. 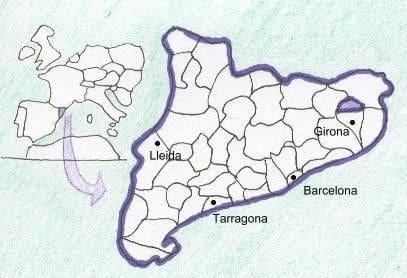 The climate of the Pla de l'estany region is the typically Mediterranean one. The proximity with the coast gives a soft temperatures during all the year. During the spring there are some sunny days with pleasant temperatures (from 8ºC at the night to 33ºC at the day or from 46ºF to 91ºF), which will allow you to enjoy the privileged natural environment. The summers, quite warm (from 15ºC to 35ºC or from 59ºF to 95ºF), they allow to carry out every type of aquatic activities. In the autumn, however, the rains are frequent and the temperature is from 8ºC to 28ºC or from 46ºF to 82ºF. The winters are soft and dry and the temperature is from 0ºC to 20ºC or from 32ºF to 68ºF. You can consult the weather registry of the Mata´s village and the forecast.